Despite not having played any of the Bayonetta games, I was excited when Nintendo announced that Bayonetta would be joining the Super Smash Bros. roster as a DLC character. She was one of the characters that got the most votes (it’s complicated and Nintendo never really announced the details) when Nintendo did their Super Smash Bros. character poll and Bayonetta 2 is considered as one of the Nintendo Wii U’s killer apps, so I wanted to see what she could bring to the game. I know it’s been months since the Bayonetta was released, but there still might be a few people out there who could be swayed into getting her for their copy of Super Smash Bros, so let me talk about the contents of her DLC package and how Bayonetta herself fares as a Smash Bros. fighter. 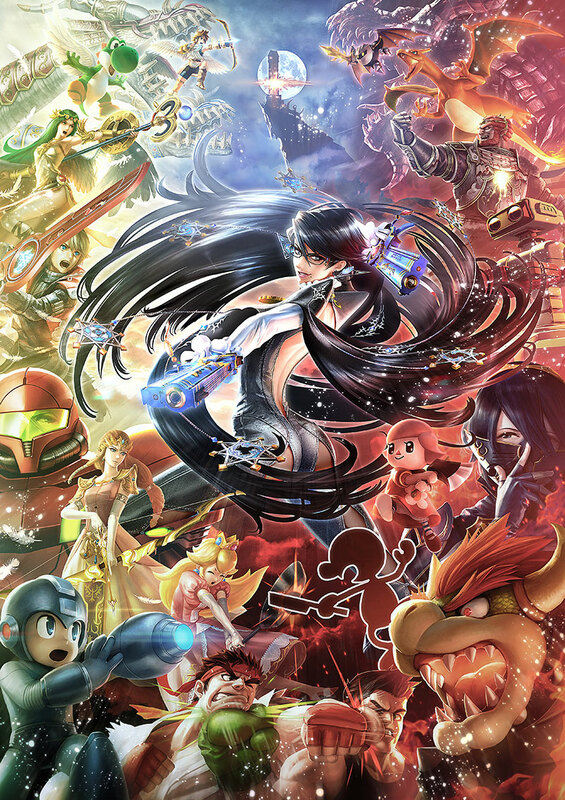 Bayonetta is now part of Super Smash Bros. massive roster of fighters! Same with the Ryu and Cloud DLC, the Bayonetta DLC can be purchased for the 3DS or Wii U separately at $5.99 (or the 3DS/Wii U bundle at $6.99) and it comes with the Bayonetta character, a stage, theme music, and trophies. Since I only have a Nintendo 3DS, I’ll talk about the 3DS version of the DLC. The Bayonetta DLC comes with two theme music which are nice but I don’t appreciate these as much as I did Ryu’s or Cloud’s, simply because I never got to play the Bayonetta games. The DLC also comes with six trophies for the 3DS DLC alone, more than what any of the other DLC packages have. These are all nice-to-haves and don’t really have any gameplay value, so lets move on to the content that really matters – the stage and Bayonetta herself. The Wii U version of the Umbra Clock Tower stage. Bayonetta’s stage is called the Umbra Clock Tower and represents stages from both the original Bayonetta and Bayonetta 2. The stage consists of a single main platform that looks like the face part of a clock tower in free fall. As the match goes on this platform routinely pauses in midair, after which several smaller ledges appear into place. These ledges appear in different positions around the main platform (sometimes even below it), are of random lengths and some even move from left to right, giving the stage a dynamic feel. The 3DS version of the Umbra Clock Tower stage. 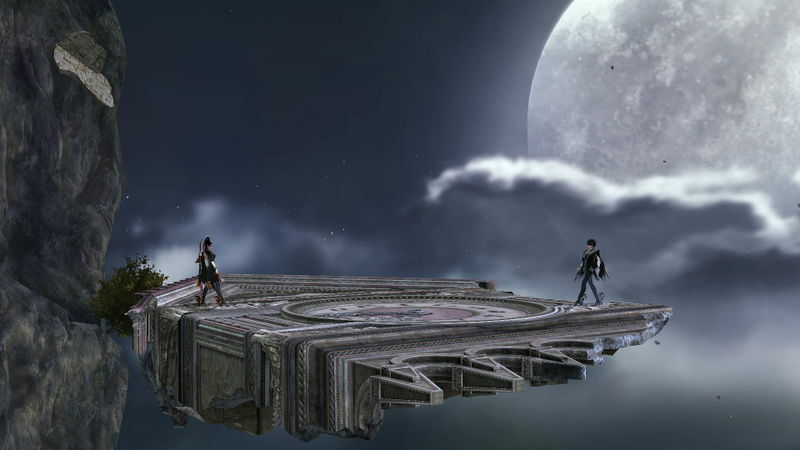 Visually, there’s a whole lot going in the background too – the stage goes from nighttime to daytime and back, and a lot of different enemies from the Bayonetta games make an appearance. But what’s really justifies getting the stage for me is what the Umbra Clock Tower stage brings to the game. It starts out simple but as the other ledges come in and out of the stage, you suddenly gain new areas that you can take advantage of defensively and offensively. The Umbra Clock Tower stage for me is a great addition to the game as it finds the right balance between order and chaos – not as wild as Cloud’s Midgar stage and not as static as Ryu’s Suzaku Castle stage. Now let me talk about the centerpiece of this DLC bundle, which is none other than Bayonetta herself. Bayonetta is most similar to Zero Suit Samus in that she’s mainly a close combat brawler that has a strong aerial game and a couple of ranged attack options. Like Cloud and Ryu before her, she brings a new minor mechanic in the game in the form of her Bullet Arts – when you hold down the attack or special button before the end of any of her attacks, Bayonetta will hold her pose when the attack ends and fire one or more of her guns to do additional damage. Bayonetta can even do Bullet Arts attacks in the middle of her combos. While only doing very small amounts of damage, Bayonetta’s Bullet Arts can help add a few more hits to her combos, disrupt possible counter attacks, and even steal some KOs from other players. She’s also got unique Smash attacks, using the Wicked Weaves powers from her games to summon the demon Madama Butterfly and get it to attack for her using it’s giant fists and feet. 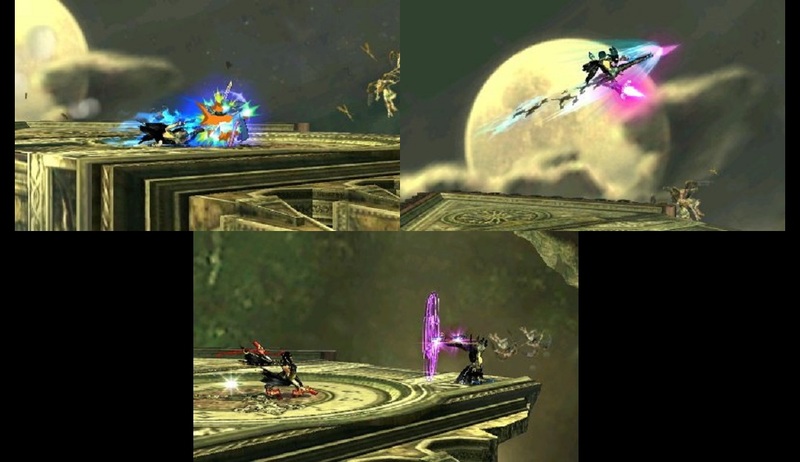 Bayonetta’s Smash attacks (clockwise from left): Her Forward Smash, Up Smash, and Down Smash. Her Special moves are also based on her attacks in the original Bayonetta games. Her Up Special is a basic upward thrusting attack called the Witch Twist that can also be used as a recovery move. Her Forward Special doubles as the Heel Slide move on the ground and the After Burner Kick in the air. The Heel Slide is a great combo starter, while her After Burner Kick serves as one of Bayonetta’s primary aerial combo follow ups. Her Neutral Special is the Bullet Climax wherein Bayonetta fires a barrage of bullets at her opponent. Some of Bayonetta’s Special Moves. But the most significant Special Move that Bayonetta has is Witch Time, her Down Special. Done late, it becomes the Bat Within (a special dodge), but timed right, Bayonetta does a special “counterattack” that instead of hitting the enemy, slows him/her instead. Witch Time is excellent as it leaves the opponent vulnerable to combo starters or to Bayonetta’s already potent Smash attacks, leading to easy kills. The devastating Witch Time – probably Bayonetta’s defining move in the game. Finally, Bayonetta’s Final Smash is also very unique. Called the Infernal Climax, the move puts the entire stage under a Bullet Time effect, slowing all the opponents down. 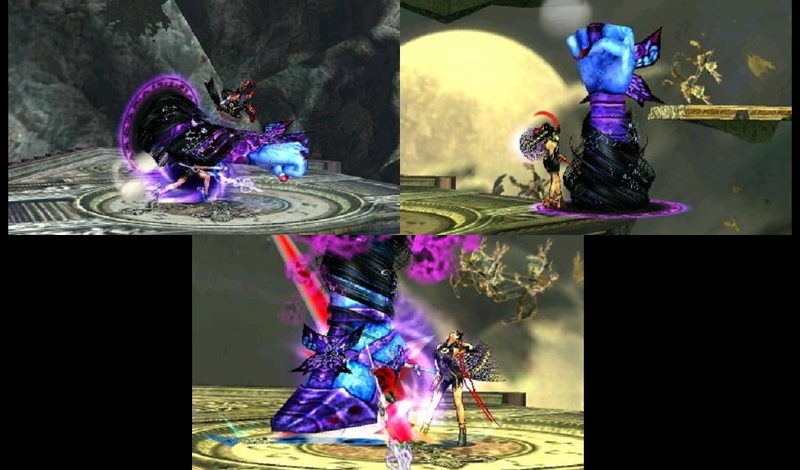 During this time, the player controlling Bayonetta has to fill up a circular meter by doing as much damage as possible. If the player succeeds, the demon Gomorrah is summoned and it does a special attack that can result in instant KOs. Like I said in my previous Smash Bros. DLC writeups, I’m not someone who can win in high level Super Smash Bros. competitions – I’m pretty much an amateur at this game. But I can say that Bayonetta is worth purchasing and picking up as a main simply based on discussions on banning her from tournaments. Do a Google search on “Bayonetta banned” and you’ll see a lot of different websites talking about how the Super Smash Bros. community in Spain is considering banning her from professional eSports tournaments. For someone who wants to get into Smash Bros. tournaments and competitions, getting Bayonetta is worth it even if you don’t plan on using her – simply fighting an AI-controlled Bayonetta will prepare you for the character. And preparation is very important in the competitive scene. To be honest, I haven’t spent enough time with Bayonetta to play well using her, but I don’t regret getting her at all because of this. To sum it all up, I highly recommend the Bayonetta DLC to anyone who enjoys playing Super Smash Bros. and still plays the game regularly to this day. Bayonetta is a great character to have, and the DLC comes with a good stage and a few other non-essential bonuses. The Bayonetta DLC is definitely worth the $5.99/$6.99 pricetag! Five Characters That Belong in Super Smash Bros.